Grant Baxter is back with the Dynamos after the veteran utility man was today confirmed by Head Coach Kevin Parrish as a part of his 2014/15 line-up having dressed for the side on the road against the Bracknell Hornets on Sunday. Grant Baxter first briefly donned the colours of the Dynamos in the 1998/99 season but became a more permanent presence in Kent from 2003 when he started a spell at the Silver Blades that would last for seven campaigns. Despite having worn the ‘C’ of captain for two years Baxter then found his way to Romford to spend a term with the Raiders in 2010/11 before swiftly finding his way home for the following season. 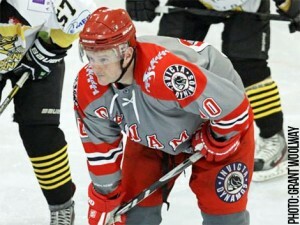 Two more campaigns later the veteran utility man then dropped to the NIHL South’s second tier to lead a youthful Invicta Mustangs however now the 37 year old will return to the Mos and bolster a line-up set to compete for NIHL South Division 1, NIHL Southern Cup and English Challenge Cup honours throughout 2014/15. He does so having already made 354 appearances in a Dynamos jersey whilst collecting 38 goals and 101 assists in the process for 139 points. In addition he holds the club record for penalty minutes with 1109 to his name. Speaking on the return of Grant Baxter, Head Coach Kevin Parrish commented that the utility man would be giving his all for the side and that what he now lacked in youth he would make up for with commitment. Parrish said, “I’m more than happy to welcome Grant back to the team as he’s a player who will do anything for the logo on the front of the jersey and will bring even more passion and determination to the changing room. He’s obviously not the youngest out there anymore but we’re competing on at least three fronts in 2014/15, hopefully four, and we need depth to keep the energy levels up to see us through the season. Grant will do a job for us and he knows his role but he’ll also be a good influence to the side off of the ice whilst doing whatever it takes to help us pick up the points. He’s a popular figure with the fans, a character to have in the changing room and I see his inclusion as a positive factor heading further into the season”. Grant Baxter will once again wear his number 38 jersey when available and should be back in action as the Dynamos host the Streatham Redskins in the NIHL Southern Cup from 5.15pm on Saturday. Tickets are available in advance from reception at the Silver Blades or on the door on the day of the game with entrance permitted from 4.30pm.